Deepen your relaxation with slow-paced music, or create a party environment with your favorite playlist. 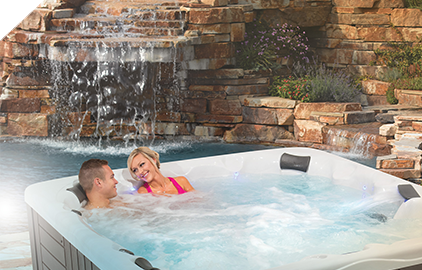 The optional Fusion Air Sound System allows you to effortlessly transform your hot tub experience. From the convenience of the water-resistant remote, to the wireless streaming, FM radio capabilities and the perfect placement of the speakers, you can select the music to set the mood. 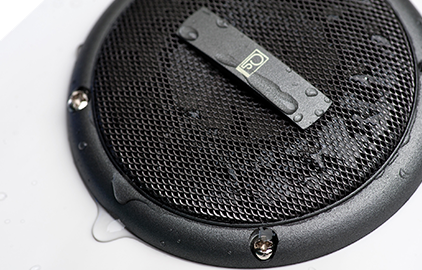 Whether you are lounging on a hot summer day or taking a quick dip to heat up in the winter, the two marine-grade speakers are designed to withstand all weather types. Mounted on the rim of the hot tub, the spa speakers are conveniently located near the headrests to generate a clear, enjoyable sound that will not be drowned out by the rumble of the hot tub jets. Let the radio take control, or quickly and easily connect your cell phone or other device to the spa stereo through Bluetooth®. With the waterproof remote, you can place your device away from the hot tub so there is no risk of water damage. Either way, your favorite tunes will complement the soothing atmosphere.